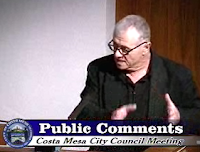 That's what we got at the Costa Mesa City Council meeting last night. First, we had Wendy Leece's geezer posse stand before the council and continue their tirade about the Senior Center. We saw Costa Mesa's grumpiest couple, Ernie and John Feeney, perform a vitriolic tag team attack. Then the theme was carried forward by a couple of perpetual malcontents - two women who apparently have worn out their welcome at The Center. They were followed by two less strident ladies singing the same tune. 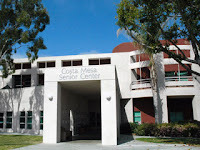 SENIOR CENTER TO CLOSE FOR A WEEK? In fairness, the subject du jour was the apparent announcement within the last day or so by the Executive Director of The Center that it will be closed for a week next month, dislocating a few hundred seniors, so she and her staff can hold some kind of planning retreat. I must admit that, without more information, shutting down the Senior Center for a week so five staff members can "plan" seems ill-advised and certainly was ill-timed, considering all the controversy swirling around The Center for the past several months. The subject seemed to catch the council and city staff by surprise. 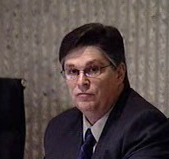 Yep, if it wasn't The Mouth From Mesa North, who frequently speaks before the council, cussing them out several times because of their position on fees proposed by the fire department (I think he might have been ticked off because his trademark black golf shirt was in the wash), it was the perpetually petulant Eric Bever pouting on almost every issue. It seemed like he was just hitting the "No" button during votes because he was peeved. One thing was confirmed last night. If you want to get our young jailer/mayor's dander up, all you have to do is say one word - TAX! It seems that when he hears that word he's just like Laurence Harvey in The Manchurian Candidate when he sees the Queen of Hearts. Mansoor immediately goes into some kind of trance and begins spouting his anti-tax mantra. Last night he attempted to give us a primer on the difference between a good tax and a bad tax. Apparently, a tax that helps fix roads is a good tax and any other kind of a tax - the Transient Occupancy Tax, for example - is a bad tax. Somehow his teeny little brain doesn't seem to comprehend that it's tax dollars that keep the city functioning. Somehow he manages to forget that it's tax dollars that pay his salary as a Deputy Sheriff - if he's still working in that job, that is. The controversial measures proposed by the Fire Chief to raise revenue generated some heated debate, both among the council members and residents, too. On a split vote, with Bever and Leece voting no, the council passed the resolution to begin assessing every resident fees for ambulance and paramedic services when they use those services. It is assumed that most folks will have health coverage that will cover those costs or will qualify for "hardship" relief. This theoretically will generate over $540,000 in new revenu e to the city. Several residents spoke against this issue, claiming that it was part of the basic services paid for by property taxes. Equally controversial was the subject of charging those responsible for traffic accidents the cost of cleaning up the "property damage" caused by the accident. Generally, we're talking about an event that spills fuel, oil or coolant on the streets or otherwise damages city property. This is supposed to generate nearly $200,000 in new revenue. 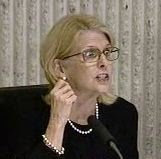 An interesting sidebar - Chief Morgan had sitting at his side as an "expert witness" one of the honchos of EF Recovery - the mysterious company mentioned in my earlier posts. Gee, I wonder who will get the contract? The vote on this one was the same - 3-2, with Bever and Leece voting no. The third item presented by the Fire Chief - the fee schedule for fire prevention inspections - was not passed. It was sent back for more information and will not likely be adopted in time to become part of the initial 2009/2010 budget. The issue proposed by the grandstanding Mansoor to reduce city council salaries by 5% passed the second reading. So, way, way off in November of 2010 the council at that time will get a meaningless pay cut and Mansoor will be looking over his termed-out shoulder and smiling that goofy smile of his. The ordinance approved in an earlier meeting was back for another try. The wording of the ordinance was buffed up to meet current state requirements and was approved. Violations will now be civil citations and all the money received will go to the city. The annual love-fest that is the renewal of the 2% levy on hotel rooms to support the Business Improvement Area (BIA) was passed, but not without some healthy discussion. Katrina Foley asked that a portion of the proceeds be contributed by the BIA to related community activities. That got Gary Monahan's Irish (sorry, couldn't resist) up, because he's apparently been wheeling and dealing with the group to kick back a pittance. The fact that Monahan gets lots of referrals to his gin mill from member hotels has more than a slight odor to it. Finally, the council approved getting an appraisal for the site of the old mini-storage at 1100 Bristol, below the 73 Freeway. It is assumed that it would make a good location for still more playing fields in a city that just can't seem to build them fast enough. They approved it only because Foley managed to find a third party - Costa Mesa United - to pay the $9,000 fee. We can't afford to buy the land, but that decision is way off in the future. Right now the appraisal is necessary to begin thinking about it. Many thanks to the good folks at Costa Mesa United for stepping up. Hey, amigos, it's Cinco de Mayo! I'm sure you're all going to celebrate in an appropriate way! Tonight's Costa Mesa City Council meeting will deal with several issues having to do with the budget and how to balance it this year. 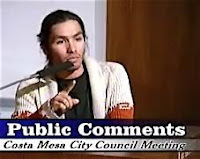 One thing that has not been discussed in an open forum lately is the pending civil trial between the ACLU, representing Benito Acosta, and the City and our mayor. DID WE BUDGET FOR ACOSTA? In these precarious financial times, with our elected officials and the city staff scrambling to find new revenue resources and ways to trim expenses so we can balance the budget, I've heard nothing about the potential of that lawsuit on our fiscal well-being. Has the city set aside some cash just in case it looses this lawsuit? If so, how much? Are we insured for the boneheaded move by our young jailer/mayor that got us to this spot? Can we actually buy stupidity insurance? So, as it turns out, the city does have insurance for this kind of thing, but it also has what amounts to a $2 million deductible. So, if this Acosta trial goes badly for Mansoor and the city, w e could be on the hook for any damages up to that amount, after which the insurance takes over. In any event, the clock is ticking on our budget - we have less than two months in which to craft a balanced budget. These are going to be a very interesting several weeks. In my last post, dated April 30th, I addressed some items that will appear before the Costa Mesa City Council on Tuesday. Three of them had to do with possible new revenue sources proposed by the Fire Department. One item, the Cost Recovery program for costs incurred by the Fire Department during the cleanup following traffic accidents in our city, proposed possible income of over $180,000. In that entry I mentioned that the staff report proposed using an outfit called "EF Recovery" which, for a 14% fee, they assured the Fire Department leadership they could recover an amazing percentage of the costs - 98.5%! I also mentioned that I visited their web site and no mention was made of this kind of business - it only addressed the sale of consumables. NOW THEY'RE IN THE BUSINESS? Even more interesting is the fact that the EF Recovery web site now has, hot off the presses, a brochure for the collection service mentioned in the earlier staff report! The date on that brochure was 4/28/09. It was not on that site when I wrote my earlier posting. Very strange.... What the heck is going on here? I suspect there might be more than a little debate on the three issues on Tuesday. I think I'd like to know a little more about this whole "EF Recovery" outfit, who runs it, etc.